Marathon is the absolute highest quality sod available. 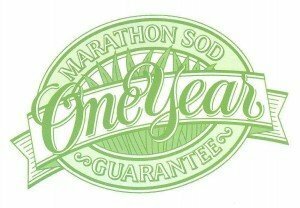 Marathon Sod is 100% weed free, vigorous, healthy, and free of damaging pests. Marathon Sod is never treated with artificial dye to enhance color or to hide defects. Marathon Sod is always cool and fresh when delivered. We use our vacuum refrigeration plant to pre-cool every Marathon order throughout the warm season to insure freshness and extend shelf life. Marathon Sod is always daylight harvested ensuring consistent quality with no substandard pieces buried in the stack. We will provide after-sale help. We have staff exclusively dedicated to answer your maintenance and troubleshooting questions. Just call 1-800-532-3489. Southland Sod Farms will provide replacement sod at no charge as needed to replace any dead areas of a Marathon Sod lawn within one year of installation. Lawn owner must demonstrate that they have made a reasonable effort to care for the lawn properly in terms of installation, watering, fertilizing and mowing. Fertilizing with Marathon fertilizers is recommended. Lawn owner must notify Southland Sod within ten days of the first appearance of dead lawn areas. Lawns without a permanent underground irrigation system will not qualify for the guarantee. An automatic controller is recommended. Lawns in shaded areas limiting more than 50% of sunlight will not qualify. Lawn areas burned by pet urine or improper application of fertilizers or chemicals will not qualify. Lawn areas that have been previously replaced under this guarantee will not qualify. This guarantee is limited to supplying replacement sod only. No labor charges, pesticide treatments, delivery, or other costs are covered.